The Bellman looked uffish1, and wrinkled his brow. As I think I've already remarked2." And changed his loose silver for notes10. And shook the dust out of his coats11. Was chalking the tip of his nose15. "Uffish" is yet another term from Jabberwocky and suggests the Bellman looks frustrated. The sound of it may come from the sound an ill-disguised sigh makes. Now, despite his hurry, the Bellman is himself indulging in palilogia. This may seem like a complete non sequitur, but Carroll rarely uses them. He prefers an absurd connection where he can take advantage of it, and in this case it is probably through one of the less well-known meanings of "murder": "spoil by lack of skill or knowledge" (OED). "Want of sense" that is, a reasonable understanding of the importance and/or circumstances at hand. From the Bellman's point of view, the Baker certainly lacks sense in these terms. Today a person speaking canadian english would probably refer to a lack of sense, or rather lack of "common sense." Common sense is meant to refer to the sort of sense everyone has, although it may be more fair to interpret it as "sense held in common" a person must make sure to take their turn with if they hope to avoid difficulties. "Pretence" along with "defence" and "practice" are among the most vexed words in terms of spelling in the english dialects I am familiar with. The difficulty relates to a combination of the problematic roman alphabet plus the influence of latin participles on english words derived from the associated latin verbs. To take the roman alphabet first, the big difficulty there is that there are actually more letters in it as it has been used to write english in the modern period than are strictly required, and some of those letters are used primarily in derivatives from french and latin. English absorbed many latin words via french, which means english has taken up a range of peculiarities inherent to the french "c" which may be soft or hard depending on the vowel following it, except when it is forced to be soft by the little squiggle attached under it called cedilla. The latin verb and participles interacted with the french "c" to create a real muddle for english speakers when it came to borrowed words built on latin verbs with stems ending in "s" in their past participles. So take a very common "s" versus "s" bugbear: practice. The noun is practice and the verb is practise, and originally was pronounced more like the noun advice versus the verb advise. Why these forms were derived from past participles makes linguistic sense if you read about the development from vulgar latin to french. The /s/ and /z/ pronunciations go back to the vexed "c" which originally represented a /k/ sound, and the way the c softened differently based on how the noun versus verb was pronounced. In any case, the trouble is the noun-verb pairs of this type have rarely kept their separate pronunciations, and the older, separated spellings are often ignored in north american written english. I heard this change in spelling roundly denounced once, and did wonder if the person denouncing wasn't engaging in a bit of mole hill expansion. However, the key point is where the pronunciation of the verb and noun have fallen together, the different spellings help when reading to sort out what is happening in the sentence, and i have actually bumped into sentences where this mattered. So I must concede to that person that mole hill expansion was warranted, to at least the size of a moderate bump on a golf course anyway. I should add that "defence" and "offence" with their companion verbs "defend" and "offend" do not come from the same family of verbs as advise-advice and practise-practice do. That's why their verb forms in english have hung onto the "d" in their stem. Pretence and its companion verb pretend are from this family as well. The Baker has upstaged the rest of the Bellman's speech by telling how to hunt the snark twice, so the Bellman can only declaim it once to make the obligatory threefold declaration  itself another old rhetorical technique. In fact, the upstaging probably irritates the Bellman more than the Baker's incapability and terror. This phrase is another version of that old canard, "don't do anything I wouldn't do" where it never fails that whoever is told this has no idea what you wouldn't do. In Carroll's rendition the paradoxical nature of the demand comes through nicely: how do you do what you don't know how to do? "England expects that every man will do his duty" is supposedly the signal sent by admiral Nelson at the beginning of the battle of trafalgar in 1805, one of the key engagements during the napoleonic wars between 1803-1815. This battle is specially famous because at the time it rendered england invulnerable at sea and unlikely to be invaded (for at least the second time) by the french. Historians agree Nelson sent a signal, while the specific wording of it is contested. As the Bellman's comments around his excerpt of it suggests, the phrase had long ago become a dreadful cliché. 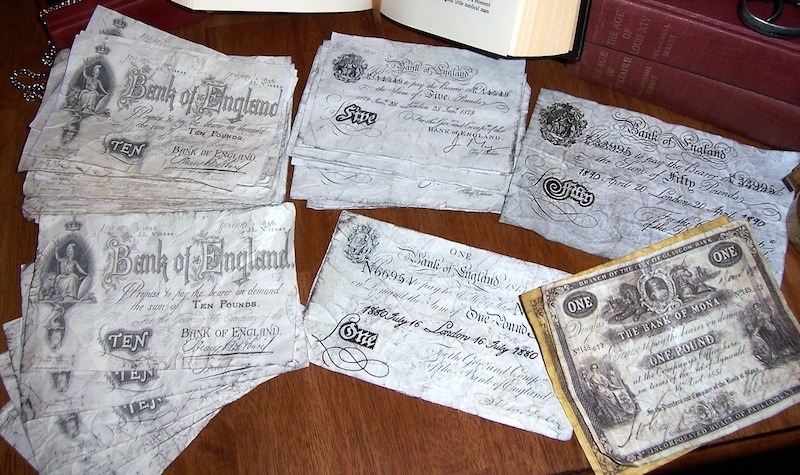 The spelling "cheque" goes back to the exchequer, which is an early word for "bank." Originally an exchequer was a chessboard that would have been laid out on a table, the table being part of the usual equipment of moneychangers world over. The mediaeval english exchequer used a counting board marked out in columns and squares analogous to a chessboard. A key factor in the reluctance to switch to the new hindu numerals from using counting boards and tables was that the person having their money changed could no longer follow the calculation through all its steps to verify they weren't being cheated. One pound banknotes probably weren't at all common, since there were several coins of similar value in wide use such as the famous (yet not actually very numerous) guinea. Instead they started at 5 pounds and went up from there, much like modern paper money. As noted above, nobody handled money who didn't want to seem "common" and the folks too poor to do the same had to pay their expenses with coins. Unlike today, this wouldn't be an inconvenience necessarily, as most small purchases could be covered by coins anyway, hence the fact that in novels and short stories from the period two shillings isn't an insulting tip. No small task, as the Baker had seven on when he came on the ship. Playing card aficionados already know the joke here. "Spade" has become a word referring to a digging tool with a square, more or less scooped blade and a sharpened edge (if you are using an unsharpened spade to do your digging, you are working too hard). In origin it comes from the term "spada" in italian and its relatives all of which mean "sword." So the playing card suit of spades is actually a suit of swords, giving away their origin in tarot cards. As well the Beaver wouldn't being a herbivore and therefore not a hunter by nature. And the Beaver would no doubt be fine with staying on the ship to get away from the murderous Butcher. The Bonnet-maker is working with the sort of bows applied to hats, though absurd images of archery bows and the like abound. This is quite doable with billiard chalk, which is usually made up in cubes covered in paper with one open end to rub the end of a pool cue on. Not being a pool or billiard player myself I don't have much appreciation of what this sort of "chalk" is for  Wikipedia explains that it is now made up of various proprietary mixes rather than chalk today  and also claims it helps improve grip between cue and billiard ball. The Butcher's ruff is illustrated as an elaborately folded number, probably made of lace. Putting such a thing on along with the rest of the gear he has on indicates he took as long to dress as possible, evidently in hopes of being left behind. Unlike the Baker who is scared and honest about it, the Butcher is busy coming up with various delaying tactics and this, a way of saying "you go first!" From this we can tell the verb galumph means to leap and run about happily, and furthermore that in the poem Jabberwocky the jabberwock killer runs home with the monster's head on foot. There is a certain irony in the contrast between the blubbering Butcher and the tremulous Baker, who never faints again after telling his story. The connection to telling his story as to why he is terrified is actually quite interesting in itself, because this is a known way to help people cope with fear and traumatic events. The Butcher never does explain his fear, and Carroll the omniscient narrator gives us no clues. In Jabberwocky we learn the jubjub bird is dangerous, although not how it is dangerous. The reference to the jubjub bird in that poem is in a scene parallel to the Baker recounting his uncle briefing him about snarks; in the earlier poem the father figure is recounting the dangerous traits of the Jabberwock and warning the young man of attendant dangerous creatures.